What's your favorite Girl Scout cookie? Mine is definitely Thin Mints. A couple of weeks ago, my husband brought home a few of boxes from work. While we certainly don't need help polishing them off, I had the itch to take some and use it to make a batch of Thin Mint ice cream. So I simply whipped up a minty ice cream base. Maybe I should say, gelato. I used a simple base recipe from The Ciao Bella Book of Gelato. It's custard base, using a higher ratio of milk to cream, which is typical of gelato recipes. I really like this because not only is it lighter, it also gives the flavor more of a chance to shine. I considered doing more of a "cookies & cream" base and flavoring the custard with vanilla but, in the end, I added peppermint extract and kept the mint theme going. I find that after churning ice cream/gelato, it's a very good idea to let it "rest" overnight or a day in the freezer. The flavor gets a chance to meld and intensify and you taste more than just the dairy. So this is another way to enjoy your Thin Mint cookies. 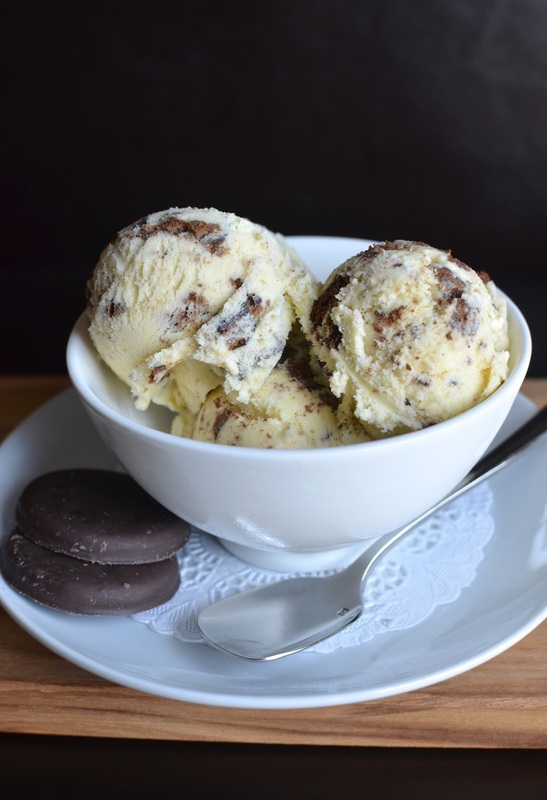 I love ice cream with chunks and lots of texture so embedding minty ice cream with hunks of Thin Mint cookies is a good way to go. I've been putting my ice cream maker to work pretty consistently. Now that spring is here and summer isn't far behind, I can't wait to whip up more batches! After making liège waffles, which is essentially brioche-dough based, I was thinking about trying my hand at making brioche bread. I happen to see a tutorial at The Kitchn just as I was thinking this so it was meant to be. Aside from the waffles, I have just a little experience with brioche dough from making Smitten Kitchen's chocolate chip brioche pretzels, but I wanted to make a straightforward loaf so that's what I endeavored to do. I'm pretty happy with what I ended up with. Going into any kind of bread-making, I never know what to expect so I try not to expect too much! And when the yeast actually rises, the steps fall into place, the bread bakes up, and you end up with a fresh loaf of bread - in this case, a rich, buttery, sweet bread (just like it's supposed to be) - it's a very satisfying feeling. We enjoyed our loaf of brioche plain, toasted, with a little jam, all by itself, and...as French toast. I added a little orange zest to the custard and served the French toast with some strawberries, which I've been buying a ton of lately. Usually, I gobble up the berries so fast, there's none left to do anything with them! This time, I actually had more than enough to bake a cake with. I've always got this simple buttermilk cake in the back of my mind. I've made it with raspberries and have always wanted to try it with strawberries. Well, now I can tell you it's really good with strawberries! The cake base is perfectly easy and delicious - moist and a little tangy from buttermilk, not too heavy, and fragrant with fresh lemon zest (I particularly love the lemon zest so don't skip it!). It has a sweetness that blends well with the fruit. It's just a great everyday cake to whip up for no particular reason, or for a gathering. I feel like this is a shortcut to strawberry shortcake since it's what it tastes like, only faster to make. This simple cake is a great one to have in your repertoire for all those delicious summer berries to come! The other week, I made a batch of vanilla ice cream with the idea of using some of it to make ice cream sandwiches with these cookies. Well, I used the ice cream to make hot fudge sundaes and it wasn't until we were nearly finished with the batch of ice cream that I remembered what I originally had in mind! 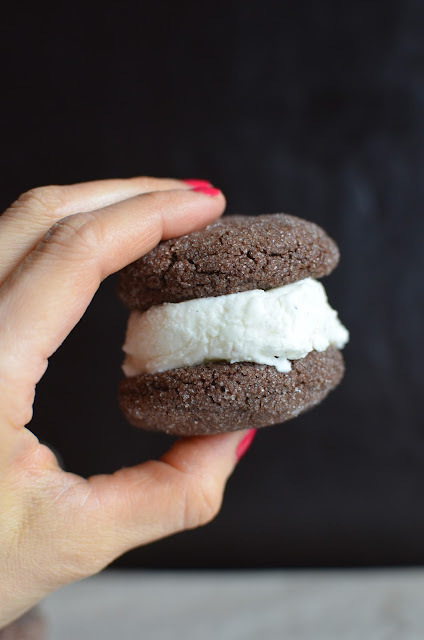 Luckily, there was enough left to make a couple of these little ice cream sandwiches happen. So small batch baking continues at my house! 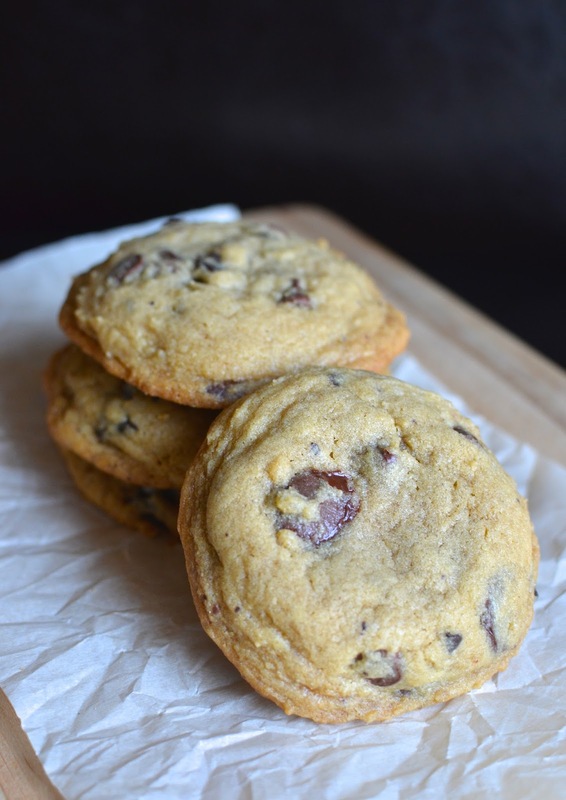 This is a small-batch recipe that makes 8 cookies but you can certainly double the recipe; it's a good idea because my family and I found them quite delectable! While I'm very familiar with the delicious, crisp "plain" vanilla sugar cookies, I really hadn't had soft chocolate sugar cookies before. I'm very happy I tried these because they're easy to make and have a wonderful texture - soft and slightly chewy. The chocolate flavor is strong - almost more so than I expected, which was a pleasant surprise. A coating of granulated sugar on the outside give the cookies a little sparkle and a nice textural contrast with a little crunch. The original recipe pairs these cookies with a raspberry curd but my mind went straight to ice cream sandwiches. I find cookies with a soft texture very compatible for making ice cream sandwiches; while they certainly do firm up, the cookies don't turn rock-hard even after freezing and still have "give" or softness to them when you bite into it. They're easy to eat. What can I say...this is a great little batch of cookies to make! The cookies are tasty all on their own but make great little ice cream sandwiches. Just pull them out of the freezer after dinner for a fun treat. I love an excuse to bake a batch of chocolate chip cookies. And when I spotted a recipe for Mrs. Fields Chocolate Chip Cookies over at Averie Cooks, it was a very compelling reason to get baking! Who doesn't love Mrs. Fields! I live in the land of malls in New Jersey but sadly, Mrs. Fields cookie kiosks are hard to come by these days. When I do walk by one, I am always assaulted (in a very good way) by the irresistible aroma. How do they make those cookies smell so good, I always wonder! I think it has a lot to do with the quantity of cookies being baked in a small space but whatever it is, Mrs. Fields cookies are some seriously delicious cookies. I'm so glad Averie posted the recipe and shared the source from over at Popsugar. If you click over, there's actually a video talking about the "secrets" to making these cookies and a demo straight from a Mrs. Fields shop (I recommend watching it because the recipe doesn't list all the steps mentioned in the video). 1) Cold butter. It apparently makes for a more stable, evenly baked cookie. What does that mean? I read that cold butter has the ability to hold air, giving baked goods more structure. I had a good feeling about this going in. Not only is using cold butter more convenient, my favorite chocolate chip cookies (which happens to be whole wheat) also starts with cold butter...could there be a connection? Apparently yes, because these cookies turned out nice and sturdy, dense and firm, yet still moist and chewy in the center. 2) Low and slow, bake at 300 degrees. Instead of the typical 350 degree oven, these cookies are baked in a low 300 degree oven, for a longer period of time, about 18-22 minutes. This is supposed to help create the crisp edge yet soft and chewy center. I was a little skeptical. Would the cookies turn out too soft and would the Maillard reaction (or "browning" reaction) have a chance to happen? I didn't want anemic looking cookies but I needn't have worried because these baked evenly and browned nicely. The edges are indeed crisp; the center is chewy. 3) Chill for at least 30 minutes and cool immediately. After mixing the cookie batter, let chill for 30 minutes or so before baking; this makes for a thicker, chewier cookie. Scoop dough into 1/4-cup mounds using an ice-cream scoop if you have one. The larger bakery-style cookies give you more of a contrast between the crispy edges and the soft and chewy center. After baking, immediately remove the cookies to a cool surface to stop the cooking process. In a nutshell, these cookies turned out better than I expected. Maybe I should've had more faith to begin with but how many times have you tried a "copycat" recipe that fell short? But these cookies are like the Mrs. Fields chocolate chip cookies we remember. The thing I like most about it is the "commercial" look and feel of them. That might sound strange but what I mean is they have the appearance - the heft, sturdiness, contrasting textures (crisp sides, chewy centers) - that I want to mimic at home and often find hard to do. I often suspect that those bakery-style cookies involve shortening but now I see it can be achieved without special flours and with butter. I recently finished reading a book recommended to me by a friend called, Quiet: The Power of Introverts in a World That Can't Stop Talking. It begins with a focus on Rosa Parks and talks about her quiet courage. So Rosa Parks has been on my mind, and when I happened to spot a recipe for her "featherlite" peanut butter pancakes over at Food52 a few days ago, I knew what I had to do. I had to make these pancakes. I wanted to make these pancakes - to think about Rosa Parks, to honor a special woman in this tiny way. And lucky me, I got a batch of delicious peanut butter pancakes to share with my family as a result. This recipe, discovered handwritten on the back of what looks to be a bank deposit envelop, is part of a collection of Rosa Parks' papers and memorabilia collected by The Library of Congress that's now been digitalized. It's great to imagine that maybe Rosa Parks made and ate these very pancakes once upon a time. These peanut butter pancakes are special because there's actually peanut butter in the batter itself. Somehow, through the help of a generous helping of baking powder, the pancakes turn out fluffy and light, with a flavor (and aroma) that is unmistakably peanut butter. If you like peanut butter, and pancakes, I recommend you give these a try...and enjoy them in honor of Ms. Rosa Parks.